Intel's 10nm 'Cannon Lake' chips could land as soon as 2017-end, albeit in small volumes. The new chips, which will still be part of the 8th generation, are expected to go in full production by H1 2018 for a broad availability by H2 2018. At Intel's recent earnings call, the company's CEO Brian Krzanich said that Intel is readying to ship the first 10nm chips in low volume by the end of this year with high production volumes and availability during H2 2018. The chips will be part of the 'Cannon Lake' family and not surprisingly, they will still be part of the 8th generation, which will now be a mishmash of 'Kaby Lake-R' for notebooks, 'Coffee Lake' for desktops, and the new 10nm 'Cannon Lake' chips. 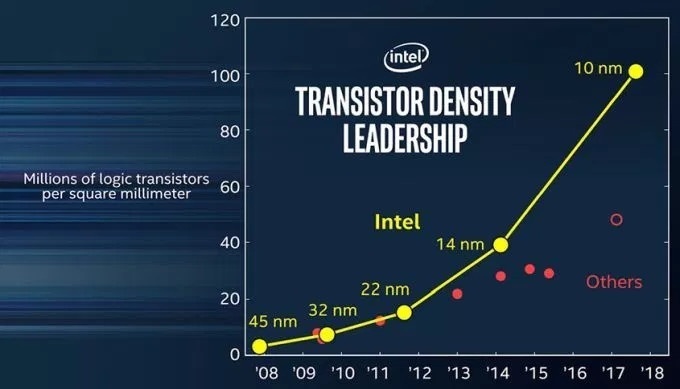 For quite sometime, Intel's 10nm plans have been a pipedream. There were earlier reports that Intel's 10nm chips would not see the light until Q2 2018. This had cast a doubt on Intel's ability to lead the die race given that smartphone SoC makers have been already been hitting the 10nm mark. Last month, Intel showed off a 10nm 'Cannon Lake' wafer much to the delight of everyone and promised that the 10nm family will comprise of a triplet of CPUs featuring 10nm, 10nm+, and 10nm++ processes. At that time, there was no ETA offered with respect to the actual availability of these chips. Although the first 'Cannon Lake' chips could land by end of 2017, users might have to inevitably wait till mid-2018 before they can purchase a 'Cannon Lake' CPU off the shelves. Intel's 'Coffee Lake' is just making its way into mainstream desktops and high-end gaming laptops, and cannibalization of 'Coffee Lake' sales due to 'Cannon Lake' would be the least of Intel's interest. Also, producing 10nm chips is not a trivial task and it will take some time before any teething issues are sorted out and enough production volumes are achieved.